That, according to police records, was what Nolan Bryce Reed immediately told police Monday evening, when they questioned him about the theft of Paul Dannels’ white 2009 Giant Yukon bike. Before I go further: The Internet can be wonderful when it rallies to raise money for someone, crowd-source information or even identify a person from photos. It’s awful when it decides to try to punish someone. The Internet can mob for good or mob for evil. Paul Dannels and his white Giant Yukon in happier times, before the tragic separation. So please don’t harass Reed or any of his family members. That’s especially true because, while the police say Reed confessed to the crime, Reed hasn’t been convicted. 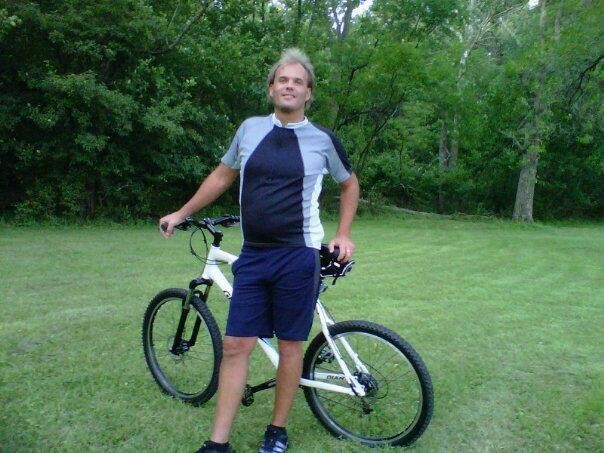 Last Thursday, Reed told police, he “basically saw an easy target … a Giant bike with a real thin cable on it” at the YMCA. With his bike stolen about a week earlier, he decided to steal it. He said he used a lighter to burn through the Kevlar of the bike lock after cutting it with small wire cutters. In the middle of the theft, Reed said, some guy asked him if it was his bike. Reed lied, told the inquisitor he’d lost his key and that's why he was trying to break through the lock. The guy snapped a few photos with his smartphone anyway. That night, I posted the photos on Facebook and wrote up an Inlander blog the next morning. That first post ramped up to over 1,150 shares. And then tips started streaming in, to both me and Crime Check. Yesterday, Sgt. Dan Ervin was assigned the case. “One of our officers went to great lengths to locate this individual,” says police spokeswoman Monique Cotton. With a flood of tips naming Reed as a suspect, Ervin compared the photos I took with Reed’s police-record photo. The face was too obscured — he couldn’t make a clear ID. The YMCA’s surveillance video, meanwhile, was too small and far away. But Ervin also saw that Reed had an existing warrant out for his arrest – a probation violation from a domestic violence conviction. Ervin and two other officers knocked on his door and asked Reed about the theft. Reed confessed quickly, police say. At officers' request, Reed showed them the T-shirt and shorts he was wearing when he stole the bike, and gave them the Dannels' pump and bike pouch. But the bike itself wasn’t there. Police say Reed claimed he gave it to a friend “he owed a bike.” But when the cops contacted the friend, the friend denied being given the bike, and a search turned up empty-handed. City prosecutor Justin Bingham says that since the bike was just shy of the $750 necessary for a felony, Reed’s case is being treated as a third-degree theft — a gross misdemeanor. Dannels, for his part, doesn’t feel like celebrating that possibility. But he says he’s looking into how he can spin this situation into ways he can help other people. And next time he gets a bike, he's upgrading his security system.